In 2014, California voters passed Proposition 1, the $7.5 billion water bond. $30 million of those bond funds are now available for agricultural water use efficiency projects, including training and technical assistance efforts to improve on-farm water stewardship. The grant application deadline for the Department of Water Resources (DWR) 2015 Agricultural Water Use Efficiency program is March 30, 2016. We encourage eligible entities to apply. Below, we provide context on the need for these types of projects, and links to the Prop 1 application materials. CAFF’s 2014 analysis of past water bonds found that just 8% of Prop 50 agricultural water use efficiency dollars supported outreach, education, and technical assistance for farmers to implement proven, on-the-ground water stewardship practices. The vast majority of funds paid for engineering projects at the irrigation district level, such as pipelines, canals and pumps. Informed by CAFF’s analysis, CalCAN and CAFF successfully worked within the legislature to ensure that funds for agricultural water use efficiency were included in the Proposition 1 bond, avoiding the mistakes of past bonds. Since Prop 1 passed, CalCAN and CAFF have advocated for effective implementation of the funds available for farm-based water use efficiency projects. In doing so, we have emphasized that there is still tremendous potential for growers around the state to implement proven water stewardship practices that save water while producing multiple environmental and economic co-benefits. For example, some soil management practices – including cover cropping, compost and mulch applications, and conservation tillage – can both increase soil water-holding capacity and reduce greenhouse gas emissions. Various efficient technologies, such as micro-sprinklers, drip irrigation, and plant needs monitoring equipment (e.g. soil moisture monitors; sap flow meters), can also help to achieve water conservation objectives. However, these technologies on their own will not automatically achieve the desired water use reductions – growers need initial and ongoing training to make the best use of these tools. Unfortunately, public support for this sort of technical assistance and training has been in short supply for a number of years, leaving farmers to rely on private specialists whose services can be prohibitively expensive or otherwise inaccessible. 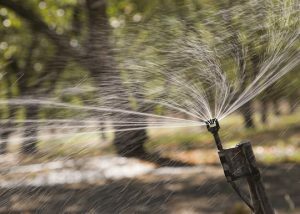 California’s new cap-and-trade-funded water-energy efficiency program, the State Water Enhancement and Efficiency Program (SWEEP), has begun to provide considerable funding for growers wishing to implement water use efficiency projects that also reduce greenhouse gas emissions. Nearly $20 million in grants have supported more than 200 on-farm projects all around the state. Indeed, SWEEP has already seen some significant successes – but due to limitations on how cap-and-trade dollars are spent, CDFA is unable to directly support training and technical assistance. DWR’s Prop 1-funded program can therefore be a crucial companion to SWEEP by funding training and technical assistance for growers looking to develop water-use efficiency projects on their operations. Following CalCAN and CAFF’s input, DWR chose to incorporate a number of new characteristics into the agricultural water use efficiency program. These additions were meant to highlight the approach detailed above. Specific inclusion of “training and technical assistance to maximize implementation of efficiencies across the state and federal water use efficiency programs”. Encourages projects that specifically seek to bolster CDFA’s granting efforts through SWEEP. A project priority criterion that projects “directly achieve or be designed to facilitate water supplier and on-farm water use efficiencies”. Encourages projects that go beyond the infrastructure level to directly engage growers and achieve on-farm efficiencies. Acknowledgement that the project evaluation process will put Technical Assistance and Training efforts together in one category, and not directly compared against wholly different types of eligible projects. Helps ‘level the playing field’ for training and technical assistance efforts that have been under-funded in previous water bond programs. A description of how improvements in soil organic matter that enhance water holding capacity of soils can count towards the qualitative benefits claimed by a project. Clearly allows applicants to take credit for the benefits of soil management practices. A description of the carbon sequestration and greenhouse gas benefits of some soil management practices, and how these benefits could be quantified and included in an application (for example, through the use of NRCS’ COMET-Planner tool). Acknowledges the dual water savings and greenhouse gas benefits of healthy soil management practices. Due in part to the program characteristics listed above, we believe this program can help move the state’s agricultural water use efficiency efforts toward an important new paradigm. But in order to make that vision a reality, DWR needs strong applications that take advantage of this program’s unique characteristics to make a clear benefit on the ground.